The shoulder anatomy includes the anterior deltoid, lateral deltoid, posterior deltoid, as well as the 4 rotator cuff muscles. Learn about these muscles, their origin and insertion points, and their functional anatomy. Plus, exercises for training them. The following is an overview of the shoulder muscle anatomy. When most people think of the shoulder anatomy, they think of the deltoids. This is because the deltoids are what you would consider the major muscles of the shoulder anatomy; they’re the muscles you see when you roll up your t-shirt sleeve or wear a wife beater. Each deltoid muscle has three “heads,” or distinct parts: the anterior, lateral and posterior deltoid heads. They are shown in the image below. The anterior deltoid is located on the front of your shoulder. It is the part of the shoulder that borders the chest muscles. Its main function is shoulder flexion, which is characterized by raising your upper arms up to the front and overhead. This muscle is targeted during front raises and pressing exercises (e.g. barbell overhead press, push press). The lateral deltoid is located on the outside of your shoulder. This is the deltoid head that, if highly developed, gives the effect of having very broad shoulders, as well as the “capped” shoulder look. Note that genetics play a major role with this, and there’s only so much one can do if he has naturally sloping shoulders. The main function of the lateral deltoid is shoulder abduction. This movement is characterized by raising your upper arms upward, at your sides. This muscle is targeted in exercises such as the dumbbell lateral raise, dumbbell raise and upright row. If you’re a beginner, you may be tempted to load up on shoulder exercises that target the outer deltoids. But please don’t fall prey to this desire. You need to develop the entire shoulder musculature (not to mention the rest of your body) before you worry about shaping this relatively minor muscle head. The posterior deltoid is located on the back of your shoulder. Its main function is shoulder extension, which is characterized by pulling your upper arms backward and bringing your shoulder blades together. This muscle is targeted in movements like the dumbbell rear deltoid raise, face pull and bent over row. …The solution? Do more compound pull exercises and isolation exercises for the posterior deltoids. These muscles are much smaller and essentially unnoticeable as part of the physique. However, they play an incredibly important role in the body. That is, in addition to stabilizing the shoulder, they provide us with the ability to rotate our upper arms and shoulders through wide ranges of motion. I have only just joined this site, and wish to express gratitude from the outset for the excellent information you are sharing about anatomy, correct technique and postural issues. I have just finished a personal training course (for my own benefit not to work as a PT for now), and this is an excellent compliment to my studies. Now regarding the shoulders, I whole heartily agree about the tendency to neglect the posterior deltoids when people emphasise push exercises such as push ups and the bench press and do not balance this with back exercises. When I started training, and before completing my course, I wreaked havoc on my shoulders by mainly boxing and doing push ups. I also love to run from time to time, as well as skip. What I suffered and also if you google this, you will find my plight is so common is this: my right arm would ache with pain during my runs, or skipping. Unfortunately, when I googled this issue, many replies sounded like ‘relax your shoulders while running’ and did not address that this ache in the arm could be related to an excessive rounding of the shoulder in which a runner was suffering ache and pain. I saw a myotherapist and she made this so clear. I had an excessive rounding of my right shoulder, and hence the right arm pain, as well as an inactive scapula and weak back muscles in general. Now I am training to correct both my muscular imbalance and right shoulder issues. I’m just seeing this comment now, but I wanted to reply anyway. I’m glad that you’ve found my anatomy articles to be so useful! …However, it sounds like you’re well on your way to recovery, especially because you’re taking such an active role in it. Let me know how your progress goes. The shoulder is pretty complex and has such a wide range of motion. Injuries and surgeries are fairly common. I am glad this site is here to give a pretty good breakdown. So often people do not research what is going on in their own body when injured and this site easily breaks everything down. I thought I was just dealing with tendonitis, then diagnosed with bursitis, then found out I had a tear. I wanted to avoid surgery as I could not take the time off. I used a cold wrap through out my day to keep the inflammation down and a blood flow stimulator to help heal and repair the damaged tissues. It took some time but week to week I saw improvements. I have heard too many stories of people worse for wear after surgery and are out for many weeks. The body has an amazing ability to heal itself. Keeping in mind, this was not a full tear. Thank you for such an informative site. I recently had surgical repair for a “massive ” rotator cuff injury, and the information on your site allowed me to become as much of an expert as a nonmedical person could be. I had full thickness tears of the supraspinatus and infraspinatus , as well as a partial tear of the sub scapularis. There was damage to the biceps tendon , which was shortened and moved , end of labrum tear that was resected and left to heal on its own. Then there was the bone work; anchors for the torn tendons, AC shaving , biceps tendon groove shaving , etc. Your site gave me a lot of peace of mind with regards to the funtionality and nomenclature of the complex shoulder joint. Hi Frank. Wow, that really must have been a massive injury with a massive surgery as well. I can only imagine physically and mentally taxing the whole process is from pre-surgery through recovery. I’m happy that my shoulder anatomy articles could give you some peace of mind! Here’s to a fast recovery. Let me know how you progress through the physical therapy. this site is awesome, I spent hours geeking out on the anatomy articles on shift the past couple days. Thanks, Victoria! I appreciate the kind words, and I’m happy you were able to learn some useful information. Hi, good explanation right there! 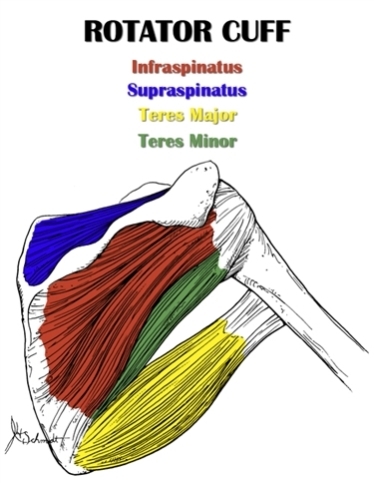 But I have to say that you putted in the picture the Teres Major and its important to clarify that it isnt one of the 4 rotator cuff muscles, The fourth is the subscapularis (which you wrote right after the picture) but the picture can confuse because you see 4 and one of them is the Teres Major and not the subscapularis.